Safe-Card ID Services: Information about issuance and use of ID Cards for Healthcare Professionals in any Setting. Changing regulatory requirements and technological advances have made security even more critical in all health-care operations. From the largest hospital provider to the smallest home-health agency, health-care providers are concerned about running efficient operations that provide the highest security possible for their employees and patients. By using various colors or emblems on badges, it is easy for patients and families to know with whom they are working, by specialty and by name. With advanced cards, paper charts and paper trails can be reduced in the ares of payroll, patient medication records, patient treatment plans, and financial or insurance information. 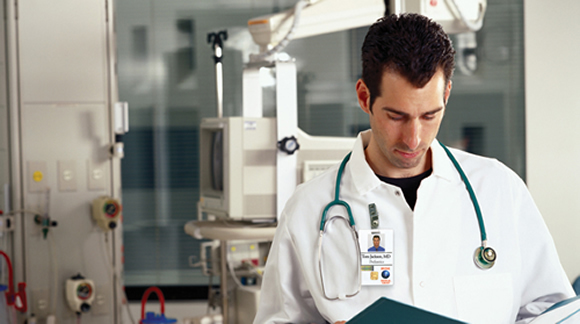 Photo ID cards in a health-care setting allow for quick identification of personnel. For organizations working to meet increasingly demanding HIPAA security regulations, photo IDs can be combined with access control systems to authorize appropriate staff and medical personnel for access to secure areas, such as a surgical suites. Cards with storage capabilities can also allow for automatic debit from personal accounts to allow for food or gift purchases. Contact our ID card experts at +1 888.485.8696 for a custom consultation or browse our web-store for popular products.